"You should remember that men fade away, while history collects their deeds and makes the final reckoning, the final judgement." 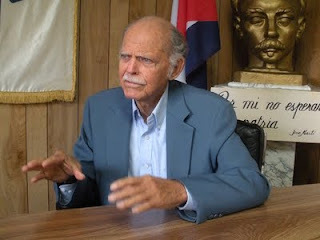 Huber Matos, then a school teacher, declared himself in opposition to Fulgencio Batista on March 10, 1952 the day that Cuban democracy came under attack. Following the extrajudicial killing of some of his former students he joined the armed struggle and ended up being one of the leaders of the revolutionary insurrection that drove Batista from power on New Year’s Eve 1958. Less than a year later he would be on trial for his life. What was his crime? 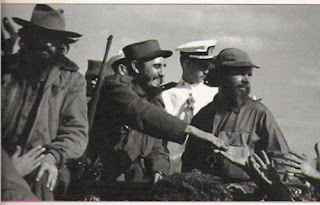 Warning Fidel Castro in several private letters, where he tendered his resignation only to have it refused, that communists were infiltrating the revolutionary government. In these letters he plainly stated:"I did not want to become an obstacle to the revolution and I believe that if I am forced to choose between falling into line or withdrawing from the world so as not to do harm, the most honorable and revolutionary action is to leave." He wrote about the aims of the revolution: the restoration of democracy and the Constitution of 1940 where in jeopardy and appealed to his former comrade in arms: "We fought in the name of Truth, for all the sound principles that bind civilization and mankind together . . . . Please, in the names of our fallen comrades, our mothers, of all the people, Fidel, do not bury the revolution." Fidel Castro made the letters public generating the crisis and denouncing the charge that communists were infiltrating the government. He ordered Camilo Cienfuegos, another popular revolutionary leader, to go an arrest Matos. 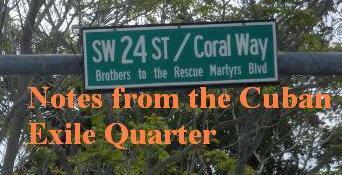 The Castro brothers began to prepare a show trial and the execution by firing squad of Huber Matos for treason. The revolutionary tribunal was prepared. Fidel Castro spoke to Matos promising that if he confessed to everything that he would not face any prison time and could go home. Matos refused, and as the show trial began and they tried to shut him up - he refused. He went on to speak for more that three hours and concluded his testimony stating: "I consider myself neither a traitor nor a deserter. My conscience is clear. If the court should find me guilty, I shall accept its decision - even though I may be shot. I would consider it one more service for the revolution." Revolutionary officers that had been convened at the trial to chant "to the execution wall" instead moved by his testimony rose up and applauded Matos. Instead of the firing squad the revolutionary tribunal sentenced him to 22 years in prison. Huber Matos would serve every day of those 22 years suffering beatings and other tortures. Camilo Cienfuegos, a figure more popular then Fidel Castro, would go missing a few days later on October 28, 1959. In 1989 another Cuban military hero Arnaldo Ochoa would be made the same offer by Fidel Castro: confess to everything you are accused of and you can go home. Ochoa accepted Castro's offer facing a long term prison sentence otherwise. After confessing everything Castro then went on television and declared the damage done to the revolution by Ochoa so great that a prison sentence was not enough and announced his execution which was carried out a short time later. The price of speaking truth to power his high, but sometimes the price of remaining silent or going along with the lie is even higher.